So, I’ve been listening to a lot of Dave Brubeck recently. By itself, this information isn’t worth commentary. After all, Brubeck was an internationally-renowned, award-winning composer-performer whose career spanned more than half a century (and over one hundred albums), so clearly, many have listened to his work before my recent discovery. What’s more interesting to me is that what finally won me over to the non-”Take Five” output of Brubeck — because, come on, everyone agrees that “Take Five” is amazing, right? 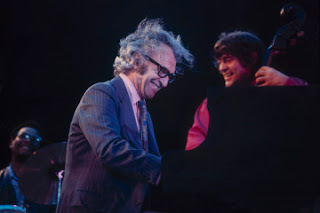 — wasn’t a Brubeck studio recording, but, rather, a live show that presented his music into something altogether different. That show was the Portland Cello Project’s “Beck, Bach and Brubeck,” which — as you might guess — features music from Beck Hansen and Johann Sebastian Bach in addition to work from the jazz great, all rebuilt to suit a band that consists of six cellists accompanied by occasional piano, drums, bass, trumpet and maybe a singer or two (For the show I saw, the accompanists on many of the songs came from the real-life School of Rock; they were all charming and accomplished). When put like that, it leaves open the possibility that it was the ways in which the Portland Cello Project had revamped Brubeck’s music that I was responding so positively to, instead of what Brubeck had written, but I’m not convinced; it wasn’t as if the Cello Project had significantly changed the melody or even intent of Brubeck’s originals — much of which had improvisational qualities already embedded in their DNA. In fact, what won me over was the experience of hearing the music being performed live — and partaking in a communal experience. Before this recent Portland Cello Project concert, I’m not sure that I’d truly realized how important live performances can be in helping you appreciate music. Or how they had shaped my understanding of — and taste in — music during my late teens and early twenties. I’m including DJ performances in this admittedly-broad, definition of “live,” because to me they contain the same essential elements: A communal musical experience that shapes and is, in turn, shaped by, the response of the crowd and the way you feel about the music from that point onwards. I’ve been reading David Byrne’s How Music Works, and he suggests that musical genres have evolved to fit the expectations of live audiences (or the absence thereof, following the invention of recording technology). The same is true, I think, of the relationship the audience has with the music they’re hearing (and dancing to, and applauding, and trying to ignore when they’re having a conversation, and so on and so on); a good concert experience can make you love a song that otherwise would leave you cold, and vice versa. We become unable to truly distinguish between the show and the songs. It’s tempting to say that some music needs that extra push of emotional connection from something else — the communal live experience — in order to be fully appreciated, but I think that’d be untrue. It all depends on the listener, surely, and whatever they can gather from a song at first listen versus the rest of us who need a little push (Certainly, I’m not going to suggest that Brubeck’s music was lacking something because I didn’t get it; that’s definitely on me, sadly). For those of us who need that kind of push, though, I feel like I’ve slowly come to understand how important the live music experience can be to bring us out of ourselves in terms of taste and expectation, and introduce us to something new, wrapped up in the more familiar guise of just going to a show. There’s something to be said for music that could never be performed in a live setting, of course, but the more I think about it, the more I find myself thinking that listening to songs being played in front of you, surrounded by countless strangers, may be the way most music is best heard for the first time – and, perhaps, every time.